RICE SCOTTI is the leader of a team of high-tech companies, some specialized in growing, research and experimentation, others in the manufacture, processing and marketing of rice. Tradition, technology, investment, a lot of efforts and firmness are reflected in products designed for the consumer who knows how to choose: the target which constantly inspires our research. Today the food is asked not only to be a source of nutrition, but also to improve durability and quality of life, and then to act as a central element in the prevention and maintenance of the best well-being. Riso Scotti, in accordance with these changing nutritional needs, acts as company-partner to the consumer, proposing a new alimentation, good for enhancing the health-conscious principles, and functional benefits of rice, without renouncing to taste: a diet that comes from rice and meets the needs of those who want to eat for pleasure but also to stay healthy. "We are a company of people committed to create value and culture in rice." To be and to be recognized as the best European food and rice industrial group. To do only good and first-rate products for your daily well-being. Our products come only from selected quality rice. 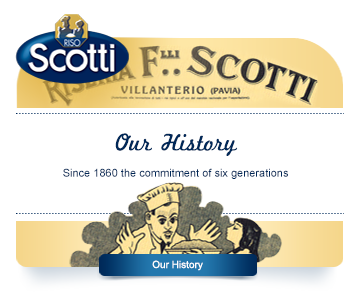 For over 150 years we work with great passion and experience this cereal. Our products come only from selected quality rice. An essential requirement at the basis of our rice’s reality is the product chain’s quality control: from the selection of partner farmers up to the final result. Earlier in the process, there’s a careful agricultural selection at the suppliers, made of a constant and careful monitoring of the cultivation procedures and of specific and specialized analysis carried out in the European laboratories. Every batch of paddy rice coming in, both conventional and from biological cultivation, is mapped according to variety, place of origin and farm in order to ensure the traceability from the field to the table. Before being introduced in the production cycle, the raw material is weighed and sampled according to strict protocols and procedures, aiming at valuing its qualitative conformity. The purpose of the analysis is determining the conformity of the product’s features of each batch of rice and the lack of infestations/pollutants, even on the batches of rice already certified as biological. Then, the paddy rice undergoes careful chemical-physical controls. During the transformation, the grains are checked and selected according to very restrictive parameters and further verifications on the finished product are carried out: organoleptic controls in order to value its look, smell and colour and chemical, physical and microbiological controls. A protocol of analysis and controls that, from the raw material up to the finished and transformed product, ensures a higher qualitative level if compared to the provisions of the Italian law. The selection of the best grains is joined with the objective of providing the maximum attention to the sustainability, that is ensured by the reutilization of rejects and production’s by-products, that convert into raw material for other following transformations. 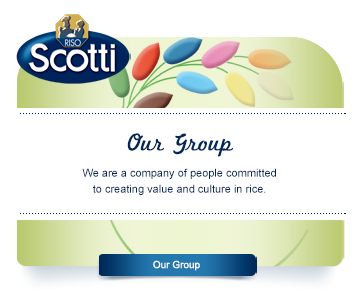 In this way the valorisation of the rice produced in Italy and of its properties is completed, proving Riso Scotti’s mission of creating the value and culture of rice. The certifications obtained from the most distinguished international bodies witness in all manufacturing and transformation processes the respect of all law parameters required by the different Countries and reference markets, and confirm the achievement of excellence of all industrial processes, even as to environment and enterprise responsibility. 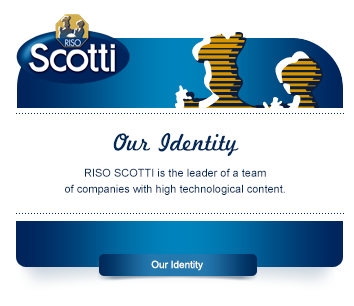 Riso Scotti E-Community the social network for people living the world Riso Scotti: a community able to share knowledge, values, goals, projects. A suitable place for communicate and know each other.